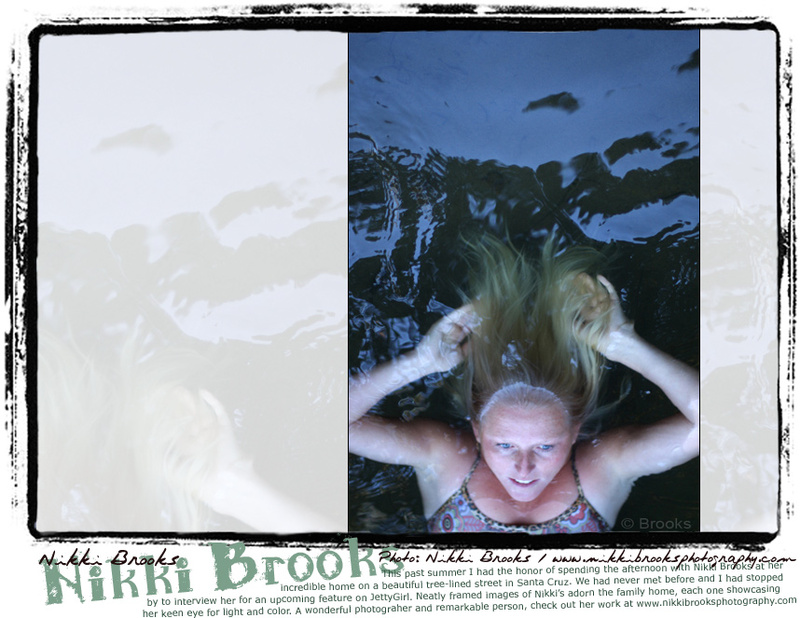 Nikki Brooks: Progression in my photography. I’ve had some great experiences and opportunities in 2008 that have led to good exposure. In 2009 I plan to be committed to my passion and I think all the hard work will pan out despite these hard times! I hope people support each other across the board and that selflessness replaces selfishness. NB: I was about 6 and I was at Cowell’s with my dad and he pushed me into waves on his Coletta log. NB: Ashley Lloyd 6'1" sugar foam single fin biscuit. This was my first board ever custom shaped and it was fun working with the multi talented Ashley and my husband Nar in the process. Doubt I will get anything new this year, but it’s always fun to try out other people’s boards, reuse what’s out there already! NB: I do have lots of heroes and heroines! Mostly folks that are happy, live simply, have a unique style, and do good work (whatever work that may be), these are the ones that inspire me and make me want to be a better person. NB: Melanie Bartels will pull something huge this year and Chris Grant will be there to document it. Carissa Moore will continue to blow minds and someday she will be the best woman surfer ever.